“Education for International Understanding” class at Itabashi First Junior High School. 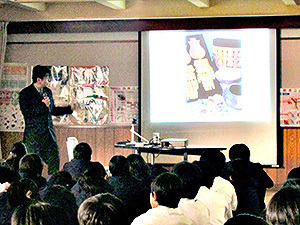 On November 13, 2014, SEKI Yuji, Vice chairperson of the Japan Consortium for International Cooperation in Cultural Heritage (“JCIC-Heritage”) and a Professor at the National Museum of Ethnology, gave a lecture as part of a class on “Education for International Understanding” at Itabashi First Junior High School in Itabashi Ward, Tokyo. 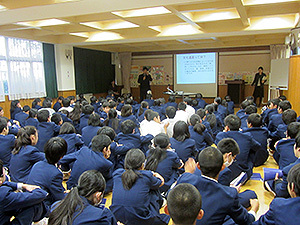 Itabashi First Junior High School is home to “volunteer efforts in support of schools.” JCIC-Heritage was invited to participate in the efforts by a regional volunteer coordinator, and JCIC-Heritage responded by sending a representative to give a lecture in connection with “Education for International Understanding.” This was JCIC-Heritage’s first invitation from a junior high school. 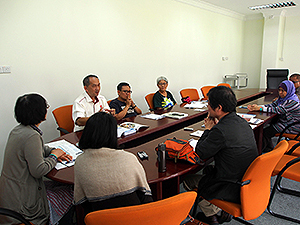 Professor SEKI, who spent his childhood in Itabashi Ward, was asked to give the lecture. Professor SEKI’s lecture, titled “International Cooperation in Cultural Heritage,” lasted 50 minutes and was attended by 150 or so students. In the first half of the lecture, Professor SEKI explained what cultural heritage is and he then used pictures of Japanese castles and Kabuki performances to describe tangible and intangible cultural heritage. Professor SEKI then explained why cultural heritage needs to be protected, what will happen if it is not protected, the importance of international cooperation to protect that heritage, and the forms of international cooperation in this field, and he used slides to give clear explanation. In the latter half of the lecture, Professor SEKI talked about his experiences with international cooperation to protect cultural heritage in Peru and he showed pictures of sites in Peru. 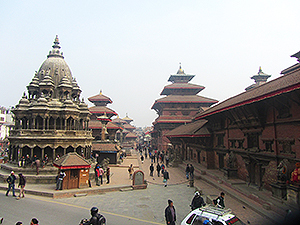 JCIC-Heritage will continue to educate and enlighten the public about international cooperation to protect cultural heritage, and JCIC-Heritage plans to inform the public about the importance of international cooperation.